The pupils will use the measuring tool for comparison of lengths and identification of right angles. Pupils will identify right angles intuitively using the measuring tool. 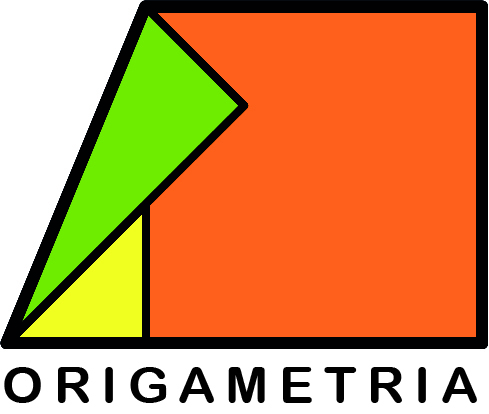 Pupils will identify right angles in various orientations. The measuring tool should be folded and kept in the pupils workbook at the conclusion of each lesson. Intuitive identification of right angles. מומלץ ללמד לפי הרצף המופיע באתר ( המותאם לפי תכנית הלימודים). התלמידים יתנסו בפירוק והרכבה ובבחינת תכונות ההכלה של המרובעים. * משך זמן הפעילות נתון לשיקול המורה, ויכול להשתנות בהתאם לגודל ואופי הכיתה. מומלץ ללמד לאחר מרובעים ניתוח תכונות, מיון מרובעים, קביעת קשרי הכלה. The pupils will identify the following quadrilaterals: Square,rectangle,trapezoid. In this lesson the pupils will investigate through folding different quadrilaterals and their properties. The final shape will be a surprize for the pupils.While folding the pupils will learn new concepts and revise previously learnt concepts. The concepts of vertices and sides of polygons. The pupils will identify the square and rectangle and know the same and different properties of each shape. The pupils will fold a rectangle from a square and investigate the lengths of the sides. The pupils will identify the following quadrilaterals: a square,a rectangle and will compare the same and different properties of each quadrilateral. The pupils will fold various rectangles and squares comparing lengths of sides. In the process of folding the model, the pupils will investigate the properties of the shapes by composition and decomposition. During the folding processes the pupil will relate to perpendicular and parallel lines and segments. There is no model in this lesson. This is a prepatory lesson to the next lesson about parallel and perpendicular lines and segments with the model of a dress. In the lesson the pupils investigate the properties of parallel and perfpendicular lines using their measuring tool. The concepts of angle,a right angle and a square. Pupils will recognise perpendicular lines and draw perpendicular lines. The measuring tool,Composition and Decomposition of Shapes, Polygons 3,Perpendicular lines and sides of polygons. In this lesson the pupils will investigate perpendicular and intersecting lines. At the conclusion of this lesson the final model will be a surprise while learning new concepts and revising previously learnt geometrical concepts. 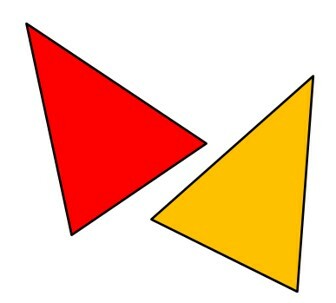 Angles,right angle,sides of a polygon. 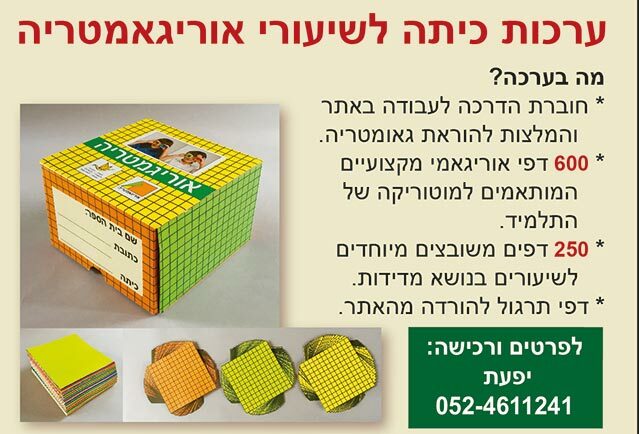 התלמידים ישתמשו במושג אלכסון. התלמידים יבנו ויזהו אלכסונים במצולע. התלמידים יחקרו תכונות של מרובעים על פי תכונות הסימטריה. התלמידים יזהו ויבחנו את האלכסונים שיופיעו במהלך הקיפול. התלמידים יבחינו בין אלכסונים שהם גם קווי סימטריה לבין אלכסונים שאינם קווי הסימטריה במרובעים. בסיום השיעור מתקבל התוצר הסופי כהפתעה, תוך לימוד מושגים חדשים וחזרה על המושגים שנלמדו בשיעורי ההכנה. לאחר שיעור זה מומלץ ללמד את שיעור הסיכום. During the folding process the pupils will identify parallel and perpendicular lines. This is the second lesson on parallel and perpendicular lines following the prepatory lesson on parallel and perpendicular lines-1 1/2. In this lesson will identify aparallel and perpendicular lines in other situations. The final model will be a surprise for the pupils and at the same time learning new concepts and revising previously learnt concepts. The concepts of angle,straight angle and square. התלמידים יזהו אלכסונים במאוזן ובמאונח ואלכסונים מחוץ למצולע. קדקודים סמוכים ונגדיים, מצולעים, סוגי משולשים, סוגי מרובעים.